Chinese popular religion is pretty dynamic. This article talks about how a local cult to the Rabbit God got started and how it is serving a local population. The guy in the picture is a Fashi, a master of methods. He is not a Daoshi (Daoist priest), but as the creator of this temple/shrine he is in charge of managing the offings people make, the amulets people take away, and the way in which the Rabbit God is addressed. Daoist priests are also called Tianshi (Celestial Masters) because they are responsible for determining, managing and updating the hierarchy of gods. The Rabbit god falls under the control of the City God. The shrine to the City God was likely the focal point of martial arts training during the Song Dynasty, and is the context from which the word gongfu (Kungfu) got its meaning. Gongfu means "meritorious action," people training martial arts on behalf of the community did so as part of their participation in the cult of the City God. 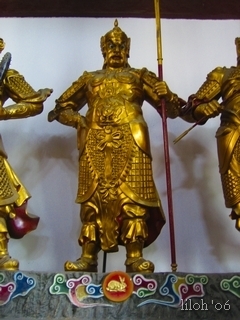 Zhenwu, the Icon (or god) we talked about yesterday is currently (since about 1650) the center of the Chinese hierarchy of gods. 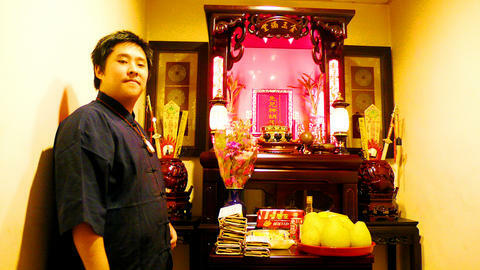 Before that it was the Jade Emperor (he is now retired). All gods deal with questions of fate and freedom. Daoist morality is not concerned with stopping behavior, it is concerned with finding one's place. Gods have a place, Demons have a place, even Starbuck's has a place.